Not to be confused with Tabarca. 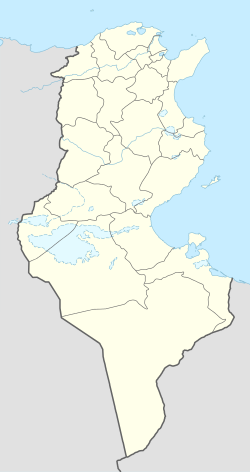 Tabarka (Arabic: طبرقة‎ Ṭbarqa) is a coastal town located in north-western Tunisia, close to the border with Algeria. Tabarka's history is a colorful mosaic of Berber, Punic, Hellenistic, Roman, Islamic, Genoese and Turkish culture. The town is dominated by an offshore rock on which is remains a Genoese castle. Nationalist leader Habib Bourguiba, later president of post-independence Tunisia, was exiled here by the French colonial authorities in 1952. Tourist attractions include its coral fishing, the Coralis Festival of underwater photography, and its annual jazz festival. Tabarka was known to the Carthaginians as TBRKʿN (Punic: 𐤕𐤁𐤓𐤊𐤏𐤍). This was transcribed into Greek as Thaúbraka (Θαύβρακα) and Latin as Thabraca. Modern day Berber knows it as Tabarka or Tbarga, and its Arabic name is Ṭbarqa (طبرقة). Although older sources placed Thabraca within the Roman province of Numidia, recent ones agree in placing it in the Roman province of Africa, known also as Africa Proconsularis. It was a Roman colony. It was connected by a road with Simitthu, which it served as a port for the export of its famous marble. At Thabraca the rebellious Roman official Gildo, the brother of Firmus, committed suicide. Under the Vandal king Gaiseric, it had a monastery for men and a convent for women. From 1540 to 1742, the Genoese maintained a garrison on the adjacent island, also called Tabarka, which lies about 365 yards (334 m) off the town. In 1540 the island was given by the Ottoman Bey of Tunis as a concession to the Genoese Lomellini family. The Genoese were in the service of Spain during 1553 at the request of Emperor Charles V who was interested in coral fishing. The Lomellini were part of the circle of Andrea Doria, Doge of Genoa, and were related to the Grimaldi family. The grant was possibly due to a secret ransom for the release of the pirate Turkish Dragut, captured in 1540 by Giannettino Doria, nephew of Andrea Doria. The Lomellini colonized Tabarca with a group of inhabitants of Pegli, near Genoa, where they had various properties and a huge palace. The community of Pegliesi lived in Tabarka for several centuries. In 1738 due to the exhaustion of the coral reefs and the deterioration of relations with the Arab population a large group of "Tabarchini" moved to San Pietro Island off Sardinia, then uninhabited, where they founded a new town of Carloforte. The transfer was made possible thanks to the King of Sardinia, Charles Emmanuel III of Sardinia who wanted to colonize those of his lands which were not yet inhabited. The name of Carloforte was chosen in honor of the sovereign. Another group of Tabarchini was resettled in the town of Calasetta on the adjacent Island of Sant'Antioco, whose population still speaks a variant of Genoese dialect originating from Tabarka. Others were moved to the Spanish island of New Tabarca. In 1741 or 1742, the Genoese fortress surrendered to the (nominally Ottoman but essentially autonomous) Bey of Tunis. At Tabarka, the ruins consists of a pit once used as a church and some fragments of walls which belonged to Christian buildings. There were also two Ottoman Turkish fortresses, one of which has been repaired. Under French colonial rule it was annexed to the civil district of Souk el-Arba, now in the Tunisian governorate of Jendouba, and a rather important fishing centre. Tabarka Jazz Festival was established in 1973. Thabraca became a Christian bishopric that is no longer a residential see but is included in the Catholic Church's list of titular sees. was also the seat of an ancient Bishopric and in antiquity it had a monastery for men and one for women, and several church Buildings and Christian cemeteries have been uncovered. The city contains several Christian cemeteries, many of the tombs covered with curious mosaics. An inscription (C.I.L., VIII, 173-82) mentions the cult of the martyr Anastasia and her companions. Clarissimus, who in 646 signed the letter from the same Council to Patriarch Paul II of Constantinople against the Monothelites. The Bishopric was founded during the Roman Empire and survived through the arian Vandal and Orthodox Byzantine empires, only ceasing to function with the Muslim conquest of the Maghreb. The diocese was re-founded in name at least in the 20th century as a titular see of the Roman Catholic church. The weather in Tabarka is usually unstable depending on the year. Summer is mostly mild and dry since it barely rains in July and August. The average temperatures for this season is 28.2 °C (82.8 °F). As for winter, it is mostly rainy and cold. Some snow can be seen during this time of the year. The average temperature for this season is 7.4 °C (45.3 °F). The airport in Tabarka was named Airport 7 Novembre until the Tunisian revolution; it was then renamed Tabarka-Ain Draham International Airport. A view from Tabarka port. ^ Head & al. (1911), p. 886. ^ "Charlton T. Lewis, Charles Short, A Latin Dictionary". Archived from the original on 28 February 2014. Retrieved 28 March 2016. ^ Chapot, V. (1928). The Roman World. Knopf. p. 385. ISBN 9780819603678. Retrieved 28 March 2016. ^ Hornblower, S.; Spawforth, A.; Eidinow, E. (2012). The Oxford Classical Dictionary. OUP Oxford. p. 33. ISBN 9780199545568. Retrieved 28 March 2016. ^ Conant, J. (2012). Staying Roman: Conquest and Identity in Africa and the Mediterranean, 439-700. Cambridge University Press. p. 48. ISBN 9780521196970. Retrieved 28 March 2016. ^ Saint Augustine; Rotelle, J.E. ; Teske, R.J. (2001). Letters 1-99. New City Press. p. 264. ISBN 9781565481633. Retrieved 28 March 2016. ^ Varela, Santiago (1983). "Nueva Tabarca / Nova Tabarca: 1. Generalidades / 1. Generalitats". Alicante / Alacant, Tabarca: Rutas de aproximación al patrimonio cultural valenciano / Rutes d'aproximació al patrimoni cultural valencià (in Spanish and Catalan). Juan Calduch; Joaquín Lara (graphic dessing). Servicio de patrimonio arquitectónico: Conselleria de Cultura, Educación y Ciencia: Generalidad Valenciana. ^ Thabraca at New Advent Catholic Encyclopedia. ^ A Library of Fathers of the Holy Catholic Church, Anterior to the Division of the East and West, Volume 17 (J.H. Parker, 1844) p294. ^ Titular Episcopal See of Thabraca at GCatholic.org. ^ a b Thabraca at catholic-hierarchy.org. ^ "Climate: Tabarka - Climate graph, Temperature graph, Climate table". Climate-Data.org. Retrieved 21 July 2014. ^ a b "Tabarka Climate and Weather Averages, Tunisia". Weather2Travel. Retrieved 19 July 2014. ^ "Tabarka, Tuisia". Voodoo Skies. Retrieved 19 July 2014. Herbermann, Charles, ed. (1913). "Thabraca" . Catholic Encyclopedia. New York: Robert Appleton Company. Head, Barclay; et al. (1911), "Numidia", Historia Numorum (2nd ed. ), Oxford: Clarendon Press, pp. 884–887 . Wikimedia Commons has media related to Tabarka. Reading Room Manchester. "CWGC – Cemetery Details". cwgc.org. Retrieved 28 March 2016. This page was last edited on 7 April 2019, at 14:45 (UTC).